Genre: Samurai drama, slice of life. Distributor: Currently unlicensed in North America. Earlier licensed by Nippon Ichi Software America. Also Recommended: Mushishi, Natsume Yuujinchou, Shigurui. Notes: Based on the manga by Natsume Ono, serialized in Shogakukan Inc. The manga is licensed by Viz. Having just been laid off his latest bodyguard job, Masanosuke Akitsu meets up with Yaichi and gets involved with the group of kidnappers known as the "Five Leaves". And that's all I have for you as a synopsis, because House of Five Leaves is a fairly short, day-to-day event show about a group of people and their everyday life.... OF CRIME! But before I begin on the review, I'd like to tell you a little something: I'm not particularly interested in Samurai drama on or in itself. I do read US manga Usagi Yojimbo, which is very much one, and probably the closest I have of a resemblance to this show that I can come up with. There's also Shigurui, of course, but that show had a more focused main story arc, not to mention a vastly darker one. In fact, let me amend that earlier comparison: House of Five Leaves is what you get when you take pseudo manga Usagi Yojimbo and marries it to Black Lagoon. Its main cast consists mostly of criminals or ex-criminals... or, in Masamune's case, a criminal-to-be. And if anything could be said about Black Lagoon, I have to give it props for introducing us to a main cast we may or may not root for as the show plays along. It's very much gray-area morals and hidden (and shadowy) pasts driving the plot along. As Yaichi puts it; his targets are usually rich and presumably deserving victims, but he himself does not want to be thought of as a honorable criminal. Rounding off the rest of the cast is Otake, a beautiful but relatively nondescript woman (particularly seeing as Yaichi lives in a brothel, surrounded by somewhat similar women at a regular basis), Matsukichi, a taciturn burglar-turned-spy and lastly Umezo, a cafe owner who, while taking parts in the various jobs the Five Leaves do, otherwise plays a clean and straight game for the sake of his teenage daughter. If you think I'm being meanspirited for describing our side cast as plain, remember that most of them work as criminals, where not drawing attention is a good idea, and the depth of the many storylines centered around the characters is what fills out their respective personalities. If you're into shows with distinct, but non-surreal art styles, House of Five Leaves will feel like someone is gently stroking your spine through your back until you shudder in pleasure. Background art in particular is drawn with a great level of detail, lending the show oodles of atmosphere through the nicks, slashes and dents in the buildings, and the rustling leaves and the flowing rivers. Colors are muted, giving the show a quiet, inconspicuous feel. Character art is a little odd and takes some time getting used to -- at first looking like shoujo gone horribly wrong. The characters are mostly impossibly tall and gaunt, and, somewhat more disturbingly, eyes are usually drawn single-color, giving them a drugged-out look. Masamune in particular looks high off his rocker at all times, what with his pupils and irises being giant orbs of blackness. 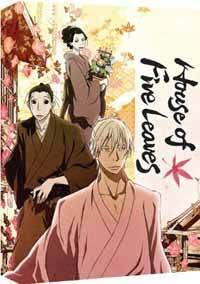 The animation itself is usually very well done, though House of Five Leaves is not an action show, so it's a little hard to tell just how good the animation is. I doubt any of you will have any complaints, though. The music in the show is also quite beautiful. I couldn't possibly tell whether it's the kind of music people listened to at the time, or something a little more modernized, but it's also one of the aspects to the show that lends it so much atmosphere. Curiously enough, the intro theme is a bit of electronica not unlike what you'd expect from Paul Van Dyk (just to do a namedrop), and curiously enough, also suits the show. The ending theme is the only odd one out here, and I'm not entirely sure how to place it. While House of Five Leaves does not have a huge, overhanging story arc, the ones that are there often stretch over more than one episode, and occasionally overlap. The show isn't the kind that walks a mile within the end of its runtime. Instead, the story progression is like peeling off layers with the intent of getting to the center, or like putting pieces of a puzzle together to form an image, your reward being a very-well thought out portrait of character pasts and motivations, not to mention interpersonal connections. The show may have a main cast of characters, but it doesn't ask of you to agree with everything they do or endorse the path their lives have taken them on. In fact, I'm surprised at just how much I've taken to this show. It took me some effort to get into it -- the slow pace and the time it takes for you to be let into these people's lives is not unlike how Maria Watches Over Us was for me, and it made me worried whether I'd ever "accept" House of Five Leaves -- but by the end, I was hooked. Completely so. It's a remarkably good period piece with a surprisingly complex cast and a great set of stories to its name. With NIS as its licensor, it does not come cheap, but at the end of the day, it's easily worth the asking price. The show is relatively light in sexual stuff, though, despite the fact that Yaichi lives in a brothel.